Christmas Party Next Week! Shanty Festival in February! Kids folk music Summer Camp in August! Come to our Christmas Party! It’s free and it’ll be loads of fun! It’s the final mail out of the year and I want to tell you about some great things we’ve got coming up as well as invite you all to our Xmas Party next week on Saturday 17th December at 14 Bacon Street (just off Brick Lane). Here’s what it will look like. Also we’ve also got a whole weekend of Maritime Music coming up in February at the Sailortown Festival at Wilton’s Music Hall. Buy your tickets now, it’s sure to sell out. Flatfoot dancing is going to take a little break at the start of next year but we’re planning on organising another term in March and April 2017 to culminate with a performance at the museum of childhood for the St George’s Day Celebrations on Sunday 23rd April. There’ll also be some sort of Play Folk tunes course happening then (possibly English folk tunes) also culminating in a performance on the same day. Summer feels a long way away but the dates have been set for our kids residential folk music summer camp. and we’re hoping to have even more fun than last year. If you know anyone with kids aged 8 – 14 who play instruments or just want to do singing and dancing please send them the link. Also tomorrow (Saturday Night) our good friend Chris Venables is organising a concert through Folk & Word – Climate, Culture & Colonialism. These concerts are always great and raise money for good causes, plus they’ve got some great artists playing including some familiar faces (including Peter Truin and the Trad Academy Sea Shanty Choir). It’s at 7pm – Friends House – Tickets On The Door (£5-£8). A couple of weeks ago ITV came and filmed us all singing and having a good time at the Elderfield Pub in Hackney. The program aired yesterday and there’s a bit featuring us at 1 minute 20 in. You can watch it here. There might be some more later on but I’m not sure cause I didn’t watch the whole thing so I can’t confirm whether there’ll be any further appearances or any references to Peter Gruin and the “single gold ring” in his ear but it was definitely a really fun night. If you’re interested in joining the sea shanty choir the new term starts on Thursday 5th January at the Museum of Childhood in Bethnal Green and new members are welcome to come for a free trial session on that date. Lastly my friend Nathan Bontrager (who’s a great fiddle and cello player and has taught a couple of workshop for the Trad Academy) is organising a workshop on using the Cello in folk music in Germany. Just to be clear you can use the material you learn in the workshop anywhere, it’s just the workshop that is taking place in Germany. I know there’s probably not many people living in Germany on this mailing list but if you know anyone in Europe who wants to attend this specialist workshop forward them the link. Right, that’s the end of the message for now. Hopefully see lots of you tomorrow at the Folk and Word Event and if not then hopefully at the Xmas Party next Saturday. Have a happy Christmas everyone and see you all soon! Free! Come and have a party with us! We’ll celebrate autumn with song. It’s hard to think how to start these e-mails but maybe a bit of rhyming is a good idea? If anyone wants to submit a rhyme for the next one just send it over. Flatfoot dancing start again on Monday! The Finnish Fiddle Tunes workshop is now open to all instruments! The new term of Sea Shanty Choir starts tonight! There’s a Shantyokee party on Friday 16th September. The Summer Camp was absolutely brilliant and we’ll be doing it again next year! First of all the flatfoot dancing classes start again on Monday at the Round Chapel. Come along wearing flat soled shoes and learn to slide around on a dusty floor. It must be Old Time season too cause there’s the Old Time Music Course starting next Wednesday at 14 Bacon Street (off brick lane). It’s a six week mixed instrumental course taught by me. Old time music is American string band music from the 1920s and 30s mostly played on banjos, fiddles, guitars and things like that. This course is a really fun way to learn to play music with other people in a relaxed atmosphere. It’s mostly for strings (banjos, guitars, fiddles, mandolins, basses etc.) but you’re welcome to come with flutes and other things if you want. If you prefer to learn your American folk music from real Americans there’s also a one-off Sunday workshop by Hen’s Teeth (Nathan Bontrager and Jane Rothfield) coming up on the 5th of November so remember, remember. Also in a week on Saturday 17th I’ll be starting up my Banjo classes at Cecil Sharp in Camden. These classes have been running for years and it’s a really nice way to learn and instrument. It’s all taught by ear and it’s nice to be in a building full of people playing music for the day. There’s loads of different classes that happen on that Saturday and I’m also running a mixed instrument beginners “folk band” so if you’re thinking of taking up an instrument come and join us. The Sunday’s Finnish Fiddle workshop is now open to players of all instruments so if you’re into Scandinavian music and want to spend the afternoon learning from a master fiddler come down to the Harrison on Sunday 18th September. If you want a longer course our resident Scandinavian Music Expert Esbjorn Wettermark will be leading a Six week mixed instrument Scandinavian Music course in the autumn. So if you want to know the difference between a Polska and Scottische or find lovely harmonies to the beautiful fiddle tunes of Hälsingland then join us this November and December. The First ever Trad Camp 2016 was a big success! We all had so much fun and we’ll definitely be doing it again next year. We played banjos (thank you Hobgoblin Music) and Fiddles (thank you Chance Kellner!) and played the first ever game of Ceilidh-Step-Dancing-Water Balloon Rounders (thank you Pete Truin)! It really was a magical week with themed lunches and dinners (Opera Lunch, Monk’s Lunch, Italy Under the Sea) and lots of music and singing. It wouldn’t have been possible without our wonderful volunteers so thank you so much Ben, Daisy, Anna C and Anna T for making it all happen! I’ll be putting up some nice pictures on the site soon and I’ll share them with you all. The choir returns to it’s weekly rehearsals from tonight at it’s new home in the Museum of Childhood in Bethnal Green. The choir have a pretty amazing touring schedule these days with two international tours under their belt and the picture of our trip to the Aland islands (shown above) reminds me of an 80s yacht rock music video video but with folk music in it. If you’re coming to the rehearsal tonight please remember that we’ll be using the entrance at the back of the musuem. If you prefer your shanties mixed with Karaoke then come along for a big party on Friday 16th September on Battersea Barge for a night of Shantyoke. It’ll be a rollicking night of live band karaoke, rip-roaring sea shanties from the Trad Academy Sea Shanty Choir, followed by some banging tunes into the night from DJ Captain Gruin. Finally, if you want to sing something other than shanties come and join James McDonald for his Gaelic singing class this Sunday at the Harrison pub. It’s going to be a mega-long four hour session and James really knows his stuff about traditional singing. Hopefully this will be the first of many more! Right, that’s it. Thank you for reading to the end! Classes in Banjo, Fiddle, Accordion, Folk Band, Melodeon, Guitar and Stepping Stone to Sessions. Wow! After a sudden flurry of activity we’ve now got loads of new stuff listed on the website and some great new courses coming up. I’ll try to summarize it here and write more about it below. There is: The choir’s new member’s session (this Thursday 21st), the amazing Trad Academy Summer Camp (for kids aged 8-13) from Sun 14th to Fri 19th August, then a Gaelic Singing workshop with James McDonald, then a six week Old Time Music course with me, then a Finish Fiddle workshop with Suvi Oskala, then in November and December Esbjorn will be teaching us Scandinavian Music again. Have I missed anything? Probably yes. Also there will be flatfooting workshop starting again in September. I imagine they’ll start on Monday 12th September and do two six week terms but I’m just confirming the room (probably at the Round Chapel again). There’ll also be another workshop with Hen’s Teeth again on Sat 5th November. More details about that to be published soon. This Thursday the choir throw open their doors to great new members young and old to come and join them in singing maritime songs and sea shanties. The session will happen at the Museum of Childhood in Bethnal Green and is completely free so come on down and join in. The choir really is a force to be reckoned with. They just sold out Wilton’s Music Hall for two nights running with their amazing production of the Rime of the Ancient Marina and it was really great. Also we managed to get about fifty members of the choir out to the Åland Island to perform at the Baltic Sea Shanty Festival earlier this month. It really was totally wonderful. There was lots of singing, dancing and partying on a massive boat (there’s a picture of it above) and we all went sailing on a smaller boat (you’ll have to imagine that one). Thank you so much to everyone who was involved in organizing the trip and making it happen. It was a huge success. Come along and join the choir! Everyone is welcome to join in the singing. This is coming up really soon. We’re going to borrow twelve banjos from Hobgoblin and teach all the kids how to play the banjo. There’s also going to be fiddle classes with Chance Kellner, singing and dance sessions everyday and there’s going to be a treasure hunt and loads of other fun stuff. We’ve been doing more planning meetings and everyone’s getting really excited about it. Thank you to our volunteers who’re coming along to help out. It’s a really good team. We’ve got enough kids signed up to make it happen but there’s still room for more so if you know anyone aged around 8-13 who plays an instrument and wants to come on a folk music summer camp this August tell them to get in touch. We’re hoping this is going to grow and grow and become and annual fixture so come along this year and you can say you were there when it all began. We’ve also got two one-off sessions at the Harrison Pub. First up is an afternoon long session with James McDonald on Gaelic singing. James is a great singer and has spent a lot of time learning from traditional singers in Ireland and Britain. If your interested in solo unaccompanied singing this is a great opportunity to learn about it but most of the singing on the day will be in groups and you won’t have to sing along if you don’t want to. I think lots of people from the Sea Shanty Choir might be interested in this course so come on down if you want to learn about some other types of folk singing. We’ve run lots of fiddle courses before at the Harrison but mostly old time fiddle. If you’re interested in learning more about the specifics of this particular type of Scandinavian Fiddle style this could be the session for you. 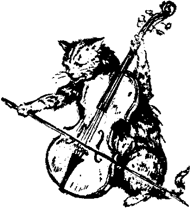 This is a rare opportunity to learn about the unusual bowing styles of Finish fiddle music. If you come along and like it you can come along and work on playing Scandinavian music in a bigger group with Esbjorn later in the year. Save the date of Saturday 5th November (how are you going to remember that?) for some more Old Time Fiddle stuff with Jane and Nathan from Hen’s Teeth. Another six week course where we can all work on playing old time American string band music together in a group. Open to all instruments but especially aimed at string players (banjo, fiddle, guitar, mandolin, bass). We’ll be working on learning tunes together by ear over the six week with an emphasis on rhythm and groove and playing together. Hopefully we can also try some small band stuff and get to hear everyone playing together in smaller groups so we can really feel the instruments interlock properly. This one’s taught by me (Ed Hicks)! I reckon we’ll start this up again on Monday 12th September probably at the Round Chapel but I just need to confirm the room booking with them. For now save the date (and six Mondays afterwards), keep an eye on the website and polish up your dancing shoes. Esbjorn’s back to teach us all more about Scandinavian Music and he’ll be extra “authentic” after spending a week at Bingsjo folk festival in Sweden (there’s a picture of Chance playing some fiddle tunes with two of Esbjorn’s friends above). This isn’t happening till November and December but again save those dates! Right, I think that’s about it for now. What a lot of good stuff we’ve got coming up! As usual there’s all the dates listed below and sorry for any mistakes I’ve made in the copy. This is not a test. Thanks to also everyone who helps out in making these things happen. There’s increasingly lots of people who help out with their time and expertise in putting all these things together and it really is great to get to work with so many good people. Ohh, and look at the picture of everyone playing music in the river at Fire in the Mountain festival above! How cool was that? There was apparently a flatfooting class in the river too. Thank you for reading to the end and look forward to seeing you all really soon. Hi Everyone and welcome to February’s newsletter. We’ve got lots of good things coming up and I’m excited to write to you all. There’s Esbjorn’s Scandinavian Music course starting next Wednesday at Bacon Street, A new term of flatfooting starting on Monday 29th February, Jane Rothfield and Nathan Bontrager are teaching one-off workshops on Old Time Fiddle and Backing Up Tunes in March and the Sea Shanty Choir just can’t stop singing! First up Esbjorn’s back to teach another six week course on playing Scandinavian Music. The course will be happening at 14 Bacon Street off Brick Lane and will culminate in a performance at the Museum of Childhood in Bethnal Green on St George’s Day Saturday 23rd April. Esbjorn’s promised to teach everyone some Engelska (literally “English Tunes”) just for the occasion. Bacon Street is just such a beautiful place to meet up and play music and everyone who’s been there has really enjoyed it. Thanks so much to Jess and Ollie for having us there. Talking of which it is the last week of the Old Time Course tonight and we’re going to have a massive session afterwards and all play all the tunes we’ve learned so if you’re in the neighborhood at 8:30-ish come and say Hi! If you play old time music bring an instrument and come on down. If Scandianvian Music isn’t your thing then maybe you’re up for coming and joining us for some flatfoot dancing on a Monday nights at the Round Chapel? Alice’s course is going great, the numbers are building up and everyone’s starting to look really good at dancing. There’s plenty of dancing in the pub afterwards too and it’s been feeling like a really great scene. This term is also going to culminate in a performance at the Museum of Childhood on Saturday 23rd April so it’ll be a chance for everyone to show off their moves or maybe do a routine like this one we did last year. We’re also extremely honoured to have Jane Rothfield and Nathan Bontrager from the USA coming to teach a couple off one-off workshop for us at the Harrison pub on Sunday 20th March. There’s be a workshop on Old Time Fiddle playing followed by one on Backing Up Tunes. Nathan plays Cello which is an unusual instrument to find in old time music but has promised to share his secrets of how to make your instrument work so if you feel you’ve been sitting in the corner with your ukulele or accordion at these sessions for too long come and hang out with Nathan. It’s also the Harrison Old Time Session that evening which will be hosted by Jane, Nathan and Me so we’ll all get to hang out and eat a roast dinner and play lots of tunes afterwards too. The Sea Shanty Choir has another busy year ahead and we’re all really excited about it. We’re thrilled to have been invited to the Baltic Shanty Festival in Finland, which will be a wonderful opportunity to share songs and experiences with other shanty enthusiasts. Big thanks to those who came along to our disco ceilidh fundraiser last month, we’re well on our way to getting everyone in the choir across the sea to the festival. We’re also really excited to be working with James Burke-Dunsmore on a retelling of the Rime of the Ancient Mariner which will be performed at Wilton’s Music Hall in July. Watch this space for more details! The choir is working hard on preparing for performances which means there aren’t any open sessions for new members planned right now but if you want to know when the next one is sign up to the mailing list (except you probably already have because you’re reading this already). Big thank you to Pete, Ellie, Anna, Kate, Duncan, Emma and everyone else who gives so much of their time to helping keep the choir going and organising the trip to Finland! It’s going to be really great! Right, that’s it for me for now. I’ve played it dangerous this time by putting lots of dates into the text in this e-mail so apologies if I’ve got any of them wrong but hopefully this time I got the subject line right. As usual check the website for the definitive dates of things and I’ve copied and pasted stuff from there below. Both the flatfooting and Scandi course are having a couple of weeks break for Easter so make sure you check your dates! See you all real soon I hope! I just clicked send on the Trad Academy E-mail’s mailchimp account and looked at my inbox and to my horror realised I’d just all of you an e-mail with the subject line you all probably saw in your inbox. I’m really sorry about that, a friend of mine offered to help redesign the mailing list and obviously typed that into the subject box when they were working. When they handed it over to me the e-mail was passed the stage where you put the subject in and I didn’t notice what’s they’d written. I’m really sorry if that offended anyone especially anyone who’s signed up to the list who I haven’t met. It probably won’t do our spam filters any good either. On the plus side I’m just glad the e-mail wasn’t about the former culture secretary. Anyhow, happy new year to everyone and I do look forward to seeing lots of you to play some tunes and sing some song soon! We’ve programmed in a new instrumental tunes course starting next Wednesday which will be looking at playing American old time music. The course will be aimed at players of banjos, fiddles, guitars and other strings but it’s open to players of all instruments – join us from Wednesday January 13th at 14 Bacon Street, London. Alice Cade’s flatfooting classes are starting up again on January 11th. Beginners are welcome – and more experienced dancers will learn something new. Everyone’s welcome to join the session in the Elderfield pub afterward (take a look at this great video of Phoebe Douthwaite in action there). Save the date for our fundraiser to raise money for the Sea Shanty Choir’s international tour. Find out more about the event here. Thanks to everyone that came to Esbjorn’s Polska course in December. It was a big success and Esbjorn was really happy with people’s progress. There’s plans to organise another one starting in March so watch this space. Once again we’ll be programming music and dance workshops over the weekend and once again there’ll be loads of great bands. Tickets available soon. Thanks for reading to the bottom! Look forward to seeing lots you at various classes, gigs and other places. If there’s a course you’d like teach, something you’d like to see us program/make happen or any other feedback do drop us a line. Send this e-mail to your friends if you think they’d be interested! I thought I’d write and let you all know there’s four more courses on the horizon. Starting off this Saturday 24th October, we’ve got Aaron Jonah Lewis and his Corn Potato String Band in town playing at the Harrison. Before their gig Aaron will be doing an hour long workshop on Old Time Fiddle in the Harrison Basement. Me and Jerry Bloom will also be opening the gig up by playing some fiddle and banjo tunes. The Corn Potatoes are a great band and do a nice combination of tin pan alley tunes, Mexican fiddle numbers and Polkas, as well as Old Time and Bluegrass, so even if you don’t play fiddle come down and have a listen. 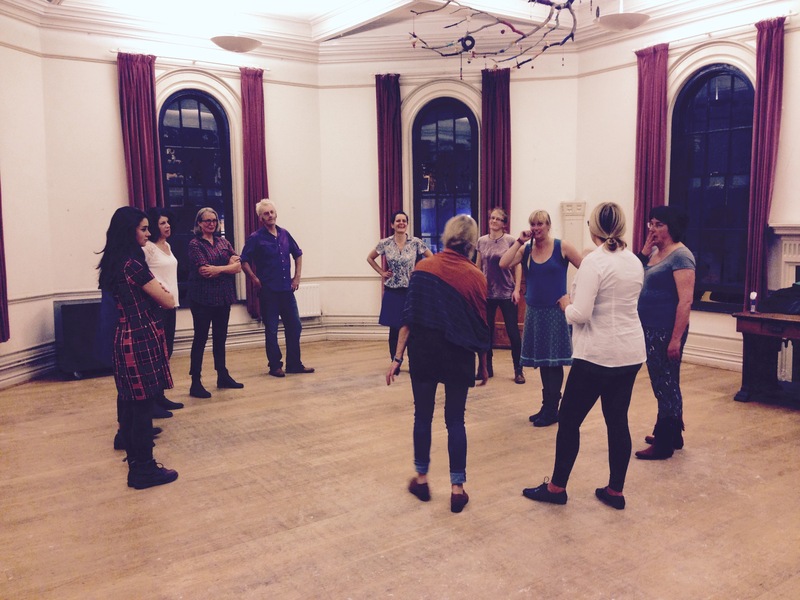 The Flatfooting Course at the Round Chapel went well and everyone had a good time. I feel like we all learned loads and big thank you to Alice Cade for doing such a good job of teaching the course. There’s going to be another six week term in the same place before Christmas. It starts up again on Monday 2nd of November so come on down and join us. If you can wear leather soled shoes that’s the best, but any hard soled shoes you can slide in will do pretty well. There’s a nice video of us dancing in the pub afterwards here. Anyone who attending Esbjorn’s Scandinavian Music Course will be pleased to know that there’s another one coming up before Christmas. It’s going to be in a new venue at 14 Bacon Street, just off Brick Lane so nice and easy to get to for everyone. This is a four week course and Esbjorn’s going to be looking at different kinds of Polskas as well as how to make harmonies and arrange a piece in “Scandi-style”. It all starts on Wednesday 11th November. After that we’ve got another open day for any new singers wanting to join the fabulous Trad Academy Sea Shanty Choir! The choir really does so much good stuff and is already working on their second album. It’s a non-audition choir and you don’t need singing experience to join, you just need to be free to come along to the Round Chapel on Thursday 5th November. The first session for new members is completely free and then if you want to join you can sign up. Last but not least there’s also a Dance Around The World event on this weekend at Cecil Sharp House which might be of interest to some dancers. There’s also a new folk listings page which is worth having a look at: check out folk and honey and one of the events that’s listed is bound to be the Harrison’s All Day Folk Festival. Right that’s the end of this message. There’s more details about the courses below and on the website. Send this message on to friends if you think they might want to come dancing and singing and hopefully I’ll see you all soon. I hope you’ve all had a great summer with lots of singing and making music and playing tunes with friends. September is here and with it comes new classes and courses. We’ve got another six week term of flatfoot dancing, a one-off workshop on Swedish music and a fiddle workshop from Aaron Jonah Lewis. The Sea Shanty choir continues to go from strength to strength and had an amazing summer and even made it on to French TV! Next Monday sees the start of a new term of flatfoot dancing taught by Alice Cade. Flatfooting is a style of step dancing from the Appalachian Mountains that’s often used to accompany old time music. It’s a solo dance so you can even practice your steps whilst waiting for buses. I’ve lined up the session so it’s just before a local music session so there’ll be opportunity to come and try out your moves after the class. This time the classes will be taking place at the Round Chapel so there should be more room for everyone. Come down and meet Alice and everyone next week and find out more there. It’s best to wear hard soled shoes (ideally leather soled) that are good for sliding and can make a nice tap when they hit the ground. Later this month we’ll be visited by Swedish traditional music duo Bridget Marsden (Violin) and Leif Ottosson (accordion). These two virtuoso musicians come highly recommended and tutor Esbjorn Wettermark has asked if we can put on a workshop so fans of Swedish music can learn from them directly. This will be an early evening mixed instrument workshop in the basement of the Harrison pub. After the workshop Bridget, Leif and Esbjorn will be playing tunes upstairs. Should be a great evening. Esbjorn is also thinking about running another six week course on Scandinavian music soon so watch this space. Aaron Jonah Lewis is also back on tour this month and on Saturday 28th October he’ll be playing with his Corn Potato String band at the Harrison pub in Kings Cross. Earlier in the day Aaron will be teaching a fiddle workshop. We’re still finalising the details of this but save the date! Last of all a big congratulations to the prolific Trad Academy Sea Shanty Choir! The choir continue to go from strength to strength and sold out Wilton’s Music Hall earlier in the summer and played a smashing gig with a full band. The choir also made their international debut performing at Paimpol Festival in Brittany. We managed to get 47 of us out there and had a wonderful time dancing to weird hypnotic Breton music, singing shanties on sailing ships and eating loads of French food. They even had a boat full of vegetable there. There’s hopefully going to be another instrumental tunes course coming up before Christmas but we’re still looking for a venue. If anyone knows any pubs or suitable places that would be available for classes on a weekday evening then send me an e-mail and I’ll look into them. That’s it for now. Save the dates and come out and join us for some flatfoot dancing next Monday! PS: Does anyone read the e-mail this far? If you did you can enter our caption competition. Winner gets a pint of beer. I really like this photo, but what is going on….? It’s the end of another term, but this time we get to celebrate with a day of performances at the Museum of Childhood in Bethnal Green. This is all happening tomorrow (Saturday 25th April) starting at 12:15 (full timetable below). Everyone on the tunes course and the flat footing courses has been working really hard on their performance pieces and the Sea Shanty Choir are all warmed up and ready to go. If you’ve ever done one of our courses come down, see your friends and enjoy big afternoon of dancing and entertainment all for free. We’ll be celebrating St George’s Day starting with a set from the Trad Academy Sea Shanty Choir at 12:15. If you enjoy their singing you’re welcome to come along to the Round Chapel next Thursday 30th April and join the choir. The choir now operates on a subscription basis and only takes on new members once a term and Thursday 30th is the next opportunity to get involved. Your first session is free and non-commitment, but if you want to join the choir you’ll be asked to sign up for a subscription. The choir’s got a really active social scene and is loads of fun. We’re all are going to Paimpol Festival in France this summer to perform so come join us and go on an international tour! After the choir there’ll be sets from Beacon Tree Brass Band and Cecil Sharp House choir, then at 15:00 the dancing commences. First of all they’ll be a set of tunes played by the Hedge Pigs. The Hedge Pigs learned a lot of their repertoire at the Trad Academy and some of them even met through attending tunes courses (which are now up to their tenth term). If you want to know about the dates of upcoming tunes courses drop me a line or make sure you’re on our mailing list (which you presumably are if you’re reading this) and like us on facebook. After that Alice Cade takes over and she’s prepared routines of Lancashire Clogging and Flat Foot dancing with the people from her dance course. We’ll definitely be running more dances courses in the future again so if you want to be kept informed send me an e-mail. The fun doesn’t stop then as we’ll have another Ceilidh played for by the tunes course graduates. These guys have only been playing together for six weeks, but they sounded amazing on Thursday and they’re going to smash it. 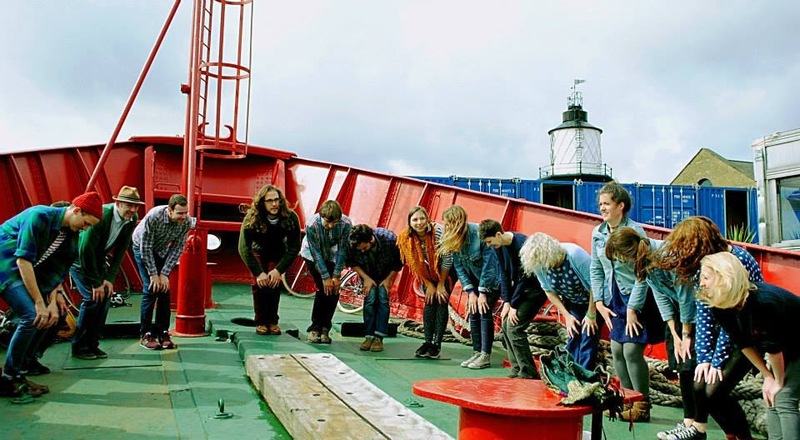 At the end of the day we hand back over to Mr Pete Gruin (formerly Truin) and the Sea Shanty Choir who will shower us in neo-traditional harmonies and are also going to sing for dancing! Come on down it’s going to be great! 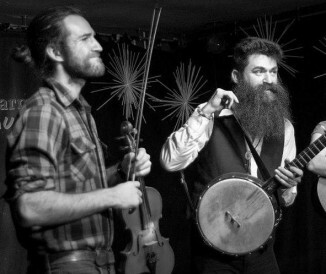 Looking further into the future at the start of June we’ve got another old time fiddle workshop at the Harrison pub this time with Aaron Jonah Lewis and Luke Richardson. I found some nice videos online and put them on the website including one of me and Aaron playing a gig on a big stage under flashing lights on a tour where we decided it was a good idea to wear matching tracksuits. Anyhow, if you’re a fiddle player, save the date and look forward to seeing you all soon! 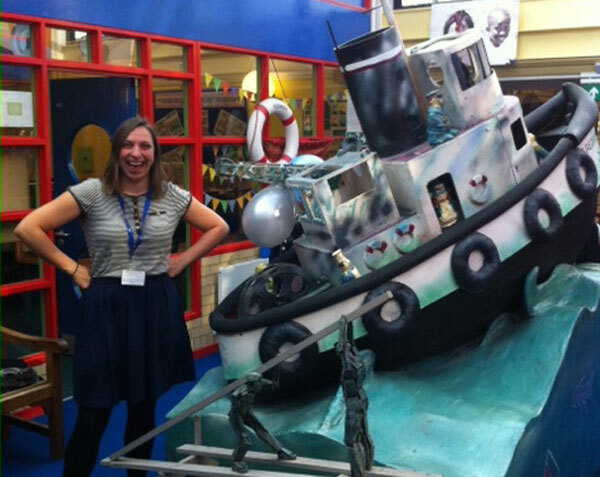 Last of all here is a picture of Sea Shanty Choir stalwart Anna Cornish with a boat! Contrary to popular rumours this is not the boat that Pete Gruin lives on or the one he’ll be sailing to France in (we hope). As ever, there’s more details below and a full running order for tomorrow. PS: The Trad Academy’s Sea Shanty Choir’s album launch is also tomorrow, but is now completely sold out. If you want to see them save the date of Friday 17th July when they should be performing at Wilton’s Music Hall. PPS: The Trad Academy will also once again be programming the workshop yurt at Fire in the Mountain Festival which is also completely sold out now. I’m afraid for that one if you haven’t got a ticket you’ll have to wait for next year. We’re starting up again this Thursday 19th at Chats Palace with two more six week courses. First of all you’ll be able to come down and stamp your feet on the floor with Alice Cade in her flatfooting courses. I’ve been busy in the wood shop and I’ve made ten new flatfoot dancing boards for people to use during the course. The boards will be available to buy at the end of the six weeks so people can keep on dancing and we’re hoping to see more people carrying strangely crafted squares of wood around London in the future. Meanwhile in the room next door we’ll be learning folk tunes and working up towards the opportunity to play for a big dance at the Museum of Childhood in Bethnal Green on Saturday April 25th. This course is going to be a little bit different to previous ones as it’s going to culminate in an opportunity to play for a dance with the public. We’re going to have to work hard, but it’ll be worth it. Anyone who’s done the play folk tunes course before is welcome to join us for any or all of the sessions and come and play for the dance. Meanwhile, down the road, we’ve got visiting American fiddler Brittnay Haas teaching an Old Time fiddle workshop at the Harrison. Brittnay is over to perform with Lena Jonsson from Sweden and it should be a great gig. The workshop will take place in the Harrison basement before the concert so come on down and learn a new tune. The last workshop with Emily Schaad was really popular and great fun. There was a really good late night tune sessions afterwards too. Thanks to everyone who came down. The shanty choir are settling into their new rehearsal space at the Round Chapel and they’re so prolific right now it’s hard to know where to start. They’ll also be coming to sing at the big event at the Museum of Childhood on April 25th and are planning to have their album launch in the Round Chapel later that night. The choir are also going international and sailing to a shanty festival in Paimpol, France this August. Watch this space for details. The new term starts on Thursday 16th April so if you want to join the choir, save the date in your diary. If you’re already a member you can check out details about coming to sing with choir at the Round Chapel here and note the choir now operates a new payment system. As usual there’s more details about the courses below. Feel free to drop me a line if you’ve got any questions or want to reserve a place on any courses. Take care and look forward to seeing all of you for music, dancing and singing soon! I hope the wintery weather’s not been getting anyone down. The good news is we’ve got three new courses starting up in the next few weeks. What better way to shake off any sadness than singing, dancing and making music with your friends. 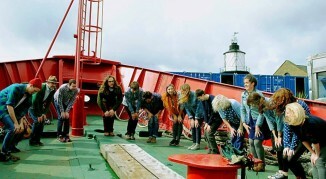 There’s flatfooting to be danced, tunes to be played and shanties to be sung! First of all I’m really pleased to announce that there’ll be another term of flat foot dancing starting on Thursday 19th March taught by the wonderful Alice Cade. It’ll be a six week course at Chats Palace and will culminate with an opportunity to perform a dance routine at the Museum of Childhood in Bethnal Green on Saturday 25th April. This should be loads of fun, there’s so much dancing going on in London these days and plenty of places where you can go and try out your new moves too. As well as that there’s more opportunities to learn how to play instrumental folk tunes with a new play folk tunes course again at Chats Palace also on March 19th. This course is a great and sociable way to meet other musicians, learn new repertoire and learn to play musically. All the tunes are taught by ear. This term we’ll also be working towards being able to play at least one tune at dance speed so we can play for a dance at the Museum of Childhood on Saturday 25th April. Last but not least the Trad Academy’s resident Sea Shanty Choir start their new term next week on Thursday 26th February. The choir’s proved so popular they’re now taking on a new bigger rehearsal space at the Round Chapel, Hackney. The choir’s also changed the way you pay for it and is now using a monthly subscription system. Be sure to come along next week for the first session of the term to find out how it all works. There’s also two more weeks of Scandinavian music left with Esbjorn at Chats so be sure to come along if you want to learn more tunes and dancing from that part of the world. Ohh and looking at that photo has reminded me that tickets are already on sale for the wonderful Fire in the Mountain Festival! In fact it’s already almost sold out. If you were there last year you’ll definitely want to go back. Amongst other great things the Trad Academy programs a whole weekend of workshops there which take place in a yurt in a beautiful dingley dell, plus there’s so much good music and lots of fun to be had. Get your ticket now or regret later! As usual there’s dates and times below and lots more details on the website.